Melt the butter in a saucepan. Add dry italian dressing mix, mushroom soup, wine, and cream cheese. Stir occasionally until cream cheese is melted and sauce is creamy. Place sliced mushrooms on the bottom of the slow cooker and top with chicken breasts. Pour sauce over the chicken and cook on low for 5 hours. Serve over white rice. 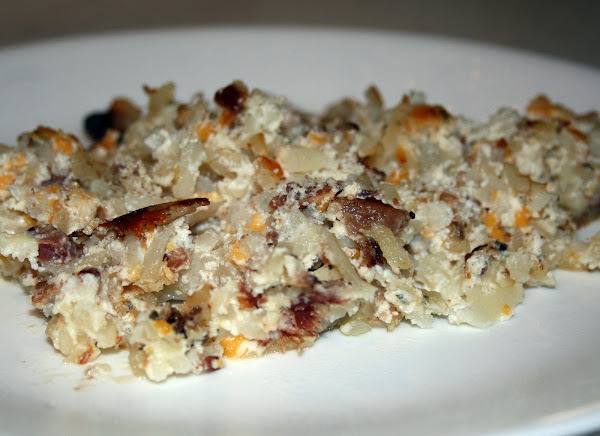 Combine first 4 ingredients, mix in hash browns. Spread into a 9x13 pan. Bake at 400 for 45-60 minutes. 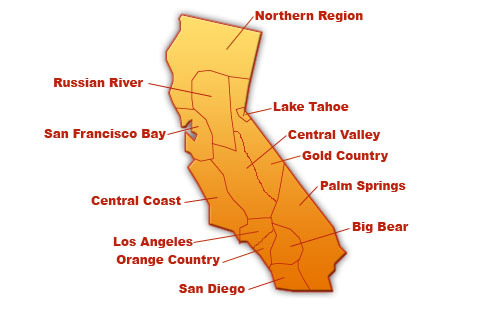 The area now known as California was settled by ranchers. It was the spanish and Mexican governments that encouraged settlement of this area. A ranch was defined when a land - grant title issued by the government was given. This title ensured property ownership rights to land.The land was normally devoted to raising cattle and sheep. Workers on these ranches included the native Americans that learned to speak spanish when they lived in the missions set up by spanish missionaries. Cattle Ranchers raised their cattle more for their hides rather than beef as there was no market for large amounts of beef. When the Gold Rush occured thousands of miners, fortune seekers and their families flooded into California. The need of meat was great and cattle prices soared with the great demand. Combine sugar, salt, and spices in a small bowl; whisk together. Place egg white in a large bowl; stir with a whisk until foamy (be sure the bowl is completely clean as if you were making a meringue). Add the almonds, cashews, and pumpkinseeds; toss well to coat. Sprinkle with spice mixture; toss well to coat. Spread nuts in an even layer on a baking sheet lined with parchment paper. Bake at 325° for 15 minutes, stirring once. Turn oven off. Remove pan from oven; stir snack mix. Immediately return pan to oven for an additional 15 minutes (leave oven off). Remove pan from oven and place on a wire rack; cool completely. Mix together the nuts, cranberries, and chocolate chips once the nuts have cooled completely. Store trail mix in an airtight container for up to 2 weeks. Sprinkle veal with salt and pepper. Place the flour, eggs and bread crumbs in separate shallow bowls. Coat veal with flour, then dip in eggs and coat with crumbs. In a large skillet over medium heat, cook veal in butter for 2-3 minutes on each side or until no longer pink. Serve with lemon. Yield: 4 servings. Brown meat, onion and pepper. Drain. Stir in sugar, broth, tomato, sauce, season. Boil. Reduce and simmer 20 minutes. Add noodles and boil til tender. Sprinkle cheese inside of bowls. 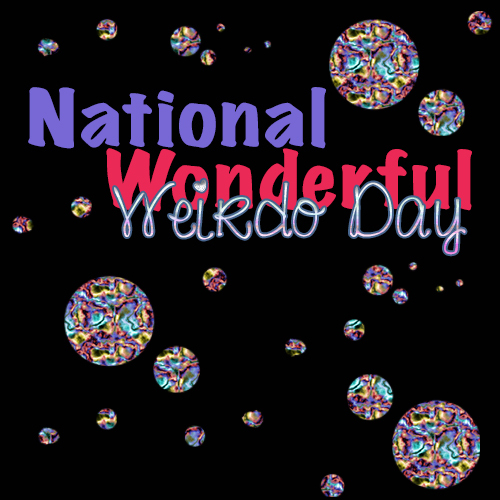 Today is national wonderful wierdo day. We all have something odd about us. 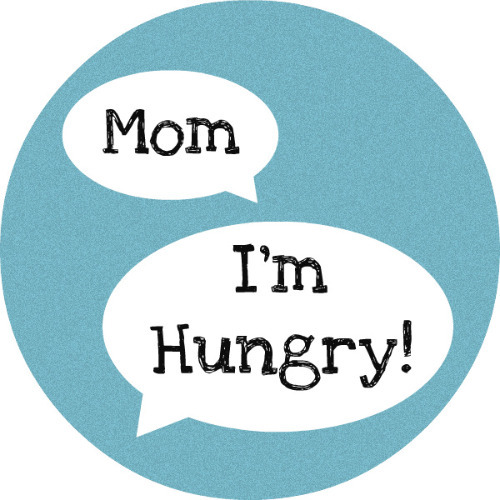 I want to introduce you to a way that we can communicate. Simply read the questions and answer them in comments. What's the main thing that builds your self-confidence and why? Self confidence comes to me believe it or not from creative criticism. 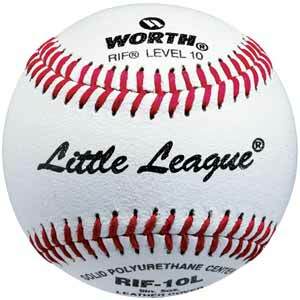 It is a burst to have me do better work and there fore I know someone is paying attention. If someone is paying attention it helps build confidence. What lessons in humility have you learned over the course of your life? How do you combat negative thoughts? Happy Birthday to me and Happy Teddy Bear Day to you. What a great day to share with one of my most beloved toys as a child. I had a teddy and I could tell him anything. In return he would lull me to sleep or put me in a good mood with the music he would play. Did you have a teddy ?? Today on Teddy Bear Day Build A Bear has an offer for you. It is one that will help you as well as someone else. You see you go in buy one of the $5 teddy bears today on Teddy Bear day and Build a bear will donate a furry friend to charity. How can you beat this, making your self happy as well as someone else. Heat oven to 375 degrees. Combine flour, baking powder, and baking soda in a medium bowl. Set aside. Combine butter, sugar, brown sugar in large bowl. Beat at medium speed until creamy. Add eggs and vanilla. Continue beating, scraping the bowl often, until mixed well. Reduce speed to low. Beat gradually adding flour mixture, until well mixed. 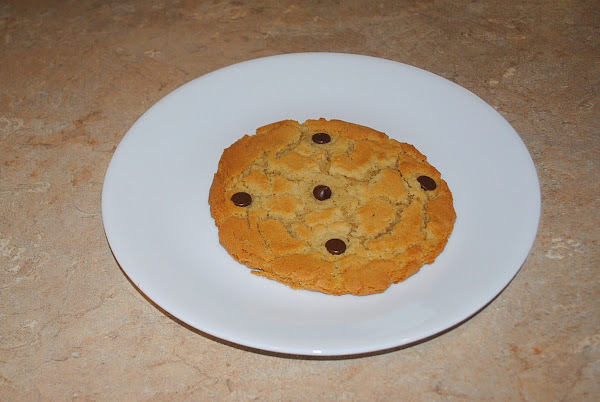 Drop dough by 1/4 cupfuls, 2" apart, onto an ungreased cookie sheet. press a few chocolate chips in dough. Bake for 10-14 minutes or until golden brown. (DO NOT OVER BAKE!) Let stand 1 to 2 minutes. Remove from cookie sheets. Get a big glass of cold milk and start dunking! Preheat the oven to 400F. Slice the zucchini length-wise and scoop out the insides with a spoon (be sure to leave the shells sturdy enough for filling later). Set aside zucchini "guts" and chop into smaller chunks for later. Place the zucchini open side up on a baking sheet and bake for about 15 minutes (continue to check though). While the zucchini is baking, brown turkey and sausage in a frying pan over medium to medium-high heat. Add water to keep from sticking to the pan, but don't add any cooking oils. 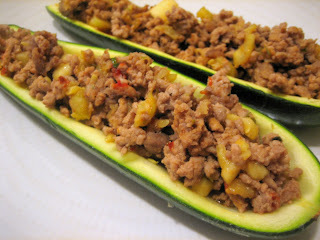 After the meat is browned, add the remaining zucchini and seasonings (peppers) and cook on medium. Add the tomato paste last to thicken the juices. Remove shells from the oven and fill with meat mixture. Serve. Turn your partner round and round it boot scoot and boogey month. September is International Square dance Month. My grand parents were square dancers back in the day. They would meet with others and dance to their hearts delight. Square dancing was imported to the U.S. from English, Irish and Scottish settlers. While fun and musical it is also great form of exercise. To work up the energy to dance the night away you will need a filling meal. The meat and potato meal is very filling and this one is flavored with onion, bell peppers and carrots as well. Slice sausage into 1/4 inch slices. You may want to remove the casings before you slice them. I don’t. In a large skillet, heat some oil and saute the sliced onions, chopped peppers, and sausage until brown. Then add sliced potatoes, carrots and spices, mixing well. 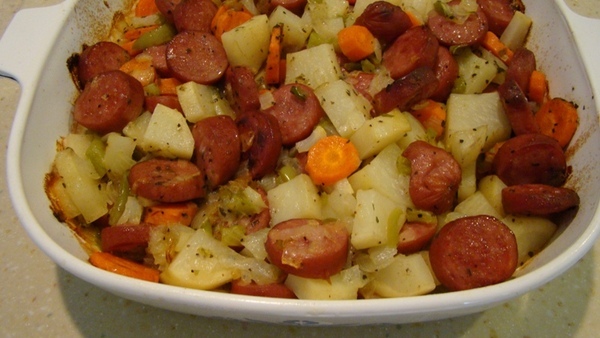 Pour mixture into a greased 2-quart casserole dish, and bake covered in a 350-degree oven, until vegetables are tender (about 45 to 55 minutes). Remove cover and bake another 5 minutes, or until browned. Serve hot. Tips: I added oil but next time I won't because the sausage has enough oil in it already. September is Baby Safety Month. 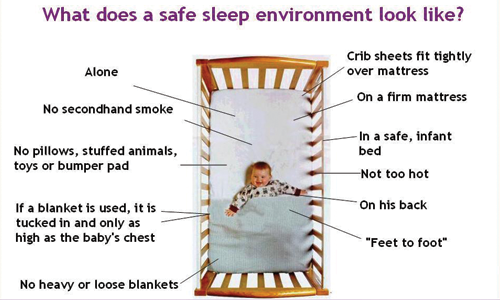 One area that often gets overlooked and mainly because we all ready think that it is safe is the babies sleep environment. There are several things that you can do to ensure their safety. These would include keeping that baby on his or her back when sleeping or napping. Babies can suffocate if they happen to sleep head down. The Center for health Statistics states the rate of SIDS has declined more then 50% since the Back to Sleep campaign began in 1994. Babies should not be allowed to sleep on chairs, adult beds, sofas, pillows or cushions. The baby should sleep in a crib approved by the Consumer Product and Safety Commission or Juvenile Products Manufactures Association. The babies crib, bassinet or cradle should have a firm mattress and well fitted sheet. There should be nothing else in the sleeping area. Crib bumpers, pillows, quilts, toys should not be placed in crib. These items can cause baby to suffocate. 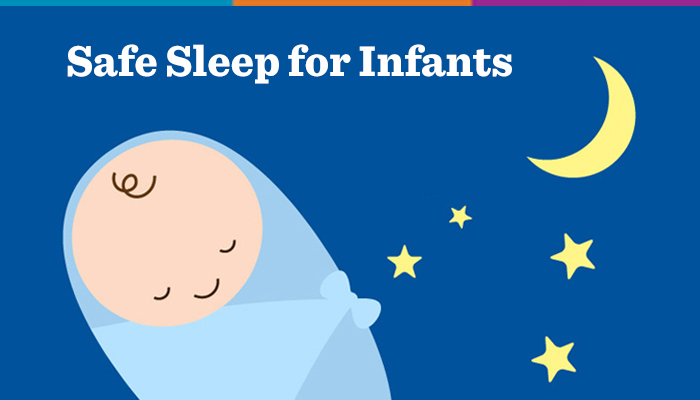 A light blanket may be used by tucking all sides along the bottom half of the crib below baby's arms. Light sleepers are best for baby. The room temp of 68 to 71 should be kept in room so baby is comfortable A fan in the babies room will help with airflow. The only precaution I offer of how baby sleeps is to ensure that babies head is turned in order to prevent flathead syndrome. Line a baking sheet with heavy duty aluminum foil. Place a cooling rack on top of the foil and lay bacon slices in a single layer on top of cooling rack. Put the whole thing in the cold oven and turn the temperature to 400 degrees. That’s right, no need to even preheat the oven! Now, just cook until it reaches your desired level of crispness. Depending on the thickness of the bacon it should take 15-20 minutes. When it is done, immediately put bacon on paper towels to soak up any remaining grease. On this day during the middle ages a king was born. That king was Richard the lionhearted. He had a reputation as a great military leader and warrior. Richard took command of his own army at the mere age of 16. Richard was a Christian and helped lead the crusades. Richards early life was spent in England he would move to Southwest France in adulthood. He could communicate well speaking both french and Occitan. Most of his life was spent leading crusades or in battle. 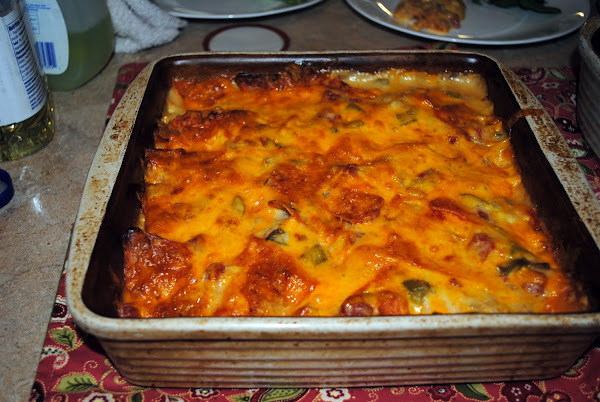 To honor a king we must prepare a dish worthy to serve a king so today we share with you a delicious cheesy King Ranch Casserole. This casserole has given you a head start by allowing you to purchase a rotisserie chicken and chips. It is simple to create and perfect for a king or a family on a busy night. Layer the chips in a 9x13 inch casserole dish. Combine the tomatoes, chicken soup, mushroom soup, bell pepper and onion. Pour half of mixture over chips. Layer the chicken pieces, half of the cheese and the remaining soup mixture. Bake at 350 degrees F for 20 minutes. Top with the remaining cheese and return to the oven until the cheese is melted. Do you ever want a reason to just tell someone that you are sorry. You may not even need to say sorry it may just be a "I Love You". 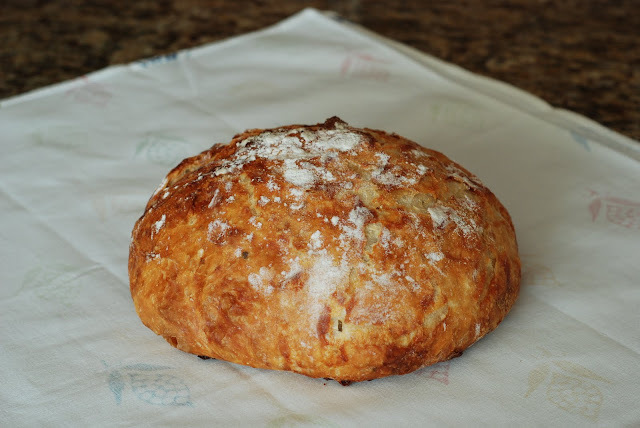 Whatever your reason is Please Pardon us as we share yet another great recipe that can be prepared and delivered to a friend for whatever reason you may need. Mix together in a small bowl; cream of chicken soup, sour cream, pepper and poppy seeds. Place aside. In a greased 9 x 13 baking dish place rice as bottom layer. Next, arrange shredded chicken over rice until rice is completely covered. Pour sour cream mixture over chicken, until chicken is completely covered. 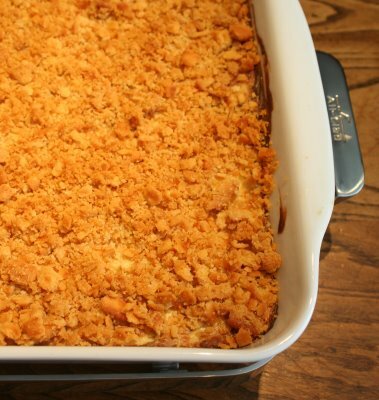 Sprinkle Ritz crumbs over the entire casserole. Pour melted butter slowly over cracker crumbs so cracker crumbs are moistened. Bake for 25 minutes. Back to school time can mean different things to different individuals. We all have feelings and some times we feel happy, other times sad and sometimes our feelings leave us wanting more. Though the schools try to keep bullying out of schools it often slips through the lines. No one wants to be bullied and the sad part is that when you are you do not want to admit that someone is bullying you. So secretly you keep these feelings inside. 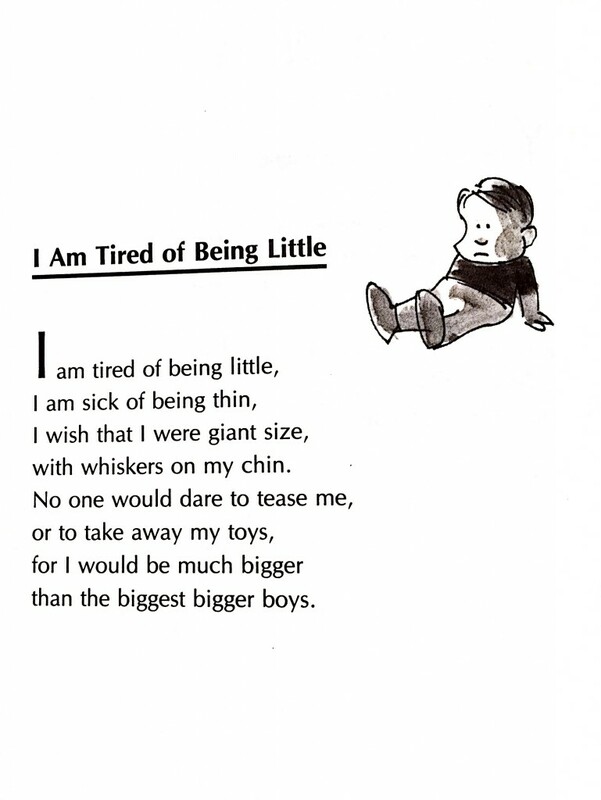 I wonder if at times the following children's poem is what may have been secretly felt. The author of this poem Jack Preluski celebrates his birthday today on September 8. Born in Brooklyn new York to an electrician and his wife. Saved early in life from a fire by his uncle Charlie who he admired. Charlie was a stand up comedian. The family was on the poor side and Jack attended Bronx public schools. He was often bored in class and did not care for poetry in this least bit. This in part was blamed on teachers who disliked poetry as well. Jack loved music and talent for it as well. He attended the music & art high school where he was happy to take part in musicals. In 1958 he graduated and attended Hunter College and studied philosophy and psychology. His downfall was English class that he attempted 3 times each time failing and eventually dropped out. Jack held many different jobs such as driving a cab, moving furniture, busboy, potter, woodworker and door to door salesman. It was in the late 1960s at a job in a bookstore and singing in coffeehouses that he met Bob Dylan who became a friend of his. Jack's past time of drawing imaginary animals eventually led to him writing poetry to describe the animals actions. The poem gained more attention than the drawing did. At the age of 24 Jack had his first poem appear in a book. Susan Hirshman would become his editor for the next 37 years. Now, if we return back to feelings, I must say that one recipe I found recently and have fallen in love with is a Mexican cheese recipe. My family loves eating at the local Mexican style recipe and one of the most popular items is the cheese and chips. Oh so yummy!!! In a slow-cooker or medium pot, combine the cheese, cream cheese, sour cream, Rotel, and about half of the milk. Turn heat onto low, and let the mixture heat until the cheeses melt and a smooth cream forms, stirring occasionally. Add more milk as needed. Once melted, serve immediately, or transfer to a slow cooker with a "warm" setting to keep dip warm and melted. Enjoy!